Lake Eufaula is a 45,181-acre reservoir located on the Chattahoochee River along the border of Alabama and Georgia. This US Army Corps of Engineers reservoir stretches from Phoenix City, Alabama, to the Walter F. George Dam at Ft. Gaines, Georgia. Eufaula National Wildlife Refuge, an 11,160-acre refuge on the edge of Lake Eufaula, provides excellent opportunities for public boating, fishing, hunting, hiking, and wildlife viewing. Numerous public access areas, marinas, campgrounds, and parks are available to facilitate boating, fishing, picnicking, and other outdoor activities, including Lake Point State Park. Lake Point State Park is located adjacent to the refuge boundary, approximately 7 miles north of the city of Eufaula. The city of Eufaula is situated on the Alabama side of the reservoir, and contains a number of hotels, restaurants, and shopping centers, as well as several historic places of interest. Since being impounded in the mid 1960’s, Lake Eufaula has had a national reputation for excellent largemouth bass fishing. Bass fishing continues to be the most popular sport on this reservoir, with anglers catching mostly largemouth bass and occasionally spotted bass. From a 16-inch limit, the minimum size limit for largemouth bass on Lake Eufaula was reduced to 14-inches on November 1, 2000. Lake Eufaula also supports an excellent black crappie fishery. Anglers especially enjoy high catch rates on crappie in the spring when the fish are spawning. At that time the fish will be concentrated along submerged trees and other shallow structures in the back of creeks such as Cowikee, Barbour, and White Oak Creek. Crappie can be caught year round by anglers who find the right depth and type of structure the fish are holding around. Summer fishing at night is often productive, usually by anglers fishing at night fairly deep with minnows underneath lights. Catfish are also abundant at Lake Eufaula, with angler catches consisting mainly of channel catfish with lesser numbers of blue catfish. Hybrid striped bass and white bass provide a great deal of excitement, especially in the spring when the fish are concentrated in the upper stretches of creeks. In the late summer and early fall, schools of white bass and hybrids often chase shad on large sandy flats adjacent to deep channels such as the areas around Old Creek Town Park and near the W. F. George Dam. Many anglers enjoy good catch rates for sunfish (bream) by fishing with worms or crickets along submerged shoreline structure during the warmer months. However, due to the extremely high populations of gizzard and threadfin shad in this reservoir, bluegill, redbreast sunfish, longear sunfish, and redear sunfish are mostly small. As the larger of the two lakes, Walter F. George lends itself better to boating activities, but numerous boat ramps are available on both lakes. Boat ramp areas include: Franklin Landing, Highland Park, Hardridge Creek Day Use Park, White Oak Creek Park, Cheneyhatchee Creek Park, Hatchechubbee Creek Park and Bluff Creek Park located on the Alabama side of the lake. East Bank Park, Pataula Creek Park, Cool Branch Park, River Bluff Park, Rood Creek Park and River Bend Park located on the Georgia side of the lake. One of the best ways to slow down and really enjoy the great outdoors is to go camping, and Walter F. George Lake offers excellent waterfront campsites, whether you like to camp in comfort or really rough it. The Corps of Engineers maintains several campgrounds which are considered to be some of the finest in the Eastern United States. Fee campgrounds like, White Oak Creek, Cotton Hill, Bluff Creek and Hardridge Creek Campgrounds offer water and electrical hookups, ample parking, grills, picnic tables, and clean shower facilities with laundries. Control gatehouses with attendants and/or hosts, and patrols by Park Rangers and local law enforcement agencies provide added security for campers and visitors. There are 13 Corps of Engineers day use parks and 4 campgrounds on Walter F. George Lake available for public use. A great place to camp, fish, boat and picnic. Enjoy the natural beauty of the lake and the Chattahoochee River, as well as the gracious antebellum mansions located in nearby historic towns, such as Eufaula, Alabama and Cuthbert, Georgia. The lake, sometimes referred to as Lake Eufaula, extents 85 miles along the Chattahoochee River and borders the states of Alabama and Georgia. With 640 miles of shoreline, Walter F. George Lake offers plenty of room for all of your favorite camping, outdoor and water related activities. The Walter F. George Lake day use parks include: Highland Park, Hardridge Creek Day Use Park, White Oak Creek Day Use Park, Hatchechubbee Creek Park located on the Alabama side of the lake. East Bank Park, Pataula Creek Park, Cool Branch Park and River Bluff Park are located on the Georgia side of the lake. 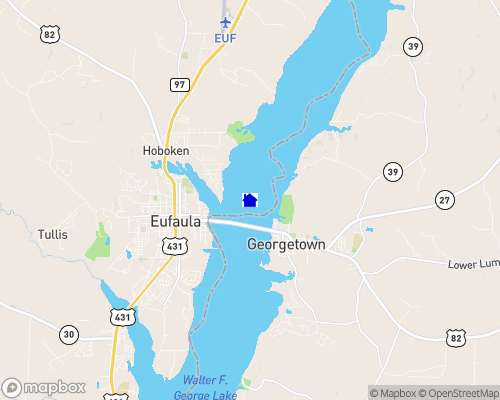 Eufaula, Alabama sometimes called the "Bluff City" is located on a high rocky bluff overlooking the Chattahoochee River and Lake Walter F. George (also known as Lake Eufaula). While not the county seat, Eufaula is the largest and most populous city in Barbour County with a population of 13,220 as of the 1990 census. Barbour County has a total citizenry of 25,417. The name "Eufaula," pronounced u-fall-ah, is from a Creek Indian word meaning "high bluff." Eufaula is governed by an elected City Council consisting of representatives from seven city districts. The Eufaula City Council meets the second and fourth Monday, of the month, at 5:30 p.m. in the Eufaula City Hall. The City Hall complex, located at 519 East Barbour Street houses the Mayor's office, The City Court Room, and the Eufaula Police Department. The Eufaula Water and Sewer Board is located at 840 W. Washington Street near Lakeview Hospital. The Eufaula Fire Department is a full time professional unit. The department headquarters and the Chief's office are located in the Central Fire Station at 115 S. Orange Street behind the Barbour County Court House. The Fire Department has branch units at the South Station located on Eufaula Avenue near State Docks Road, and the North Station at Weedon Field, Eufaula's airport on North Eufaula Avenue. Lakeview Hospital, located at 820 W. Washington Street has 74 beds, Intensive Care Unit, and Emergency Unit. Equipped with a helipad, Lakeview Hospital can expedite transportation to larger metropolitan facilities via airborne ambulance services. The Eufaula School System consists of three elementary schools: Bluff City Elementary on State Docks Road, Western Heights Elementary on Pump Station Road, and Sanford Street Elementary on Sanford Street. Admiral Moorer Middle School on St. Francis Road accommodates grades 6 thru 8, Eufaula High School on Lake Drive serves grades 9 thru 12. The combined Eufaula School System employs 200 teachers, serves approximately 3000 students and is governed by an appointed school board and general superintendent. In addition to the public school system, Eufaula has one independent private facility, Lakeside School serving grades K thru 12. Lakeside School is located on Lake Drive. Sparks College and The Beville Center for Advanced Education, also serve Eufaula.